Youll find plenty of other sites and activities to explore near our pet-friendly Red Roof Inn and Suites Cave City, some of which include, Kentucky Down Under, the National Corvette Museum, American Cave Museum and Hidden River Cave, Guntown Haunted Hotel, and Dinosaur World all just a short drive from the hotel. 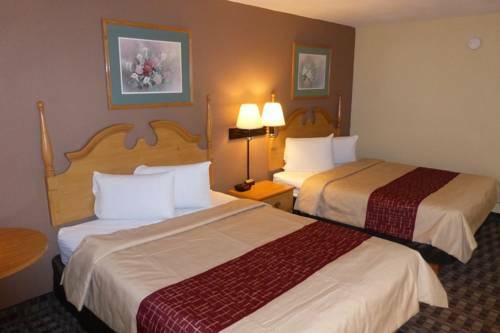 When traveling to Kentuckys Cave Capitol, enjoy home-style hospitality when you stay at Red Roof Inn & Suites Cave City. With a great location off I-65, a host of amenities including free WiFi, continental breakfast (served daily from 6:30am-9:30am), flat screen TVs, and in-room coffee in all rooms. One well behaved family pet per room is welcome at no charge and children 17 and younger stay free when occupying the same room with an adult family member. Truck parking is available! Youll find plenty of other sites and activities to explore near our pet-friendly Red Roof Inn and Suites Cave City, some of which include: Kentucky Down Under, the National Corvette Museum, American Cave Museum and Hidden River Cave, Guntown Haunted Hotel, and Dinosaur World all just a short drive from the hotel. The town of Horse Cave was literally built around the giant sinkhole of Hidden River Cave. America's most polluted cave was then cleaned up and opened to tourists. ~5 miles from Cave City. Exhibits include 80+ Corvettes. In 2014 a sinkhole opened beneath the central dome, swallowing eight cars. The five most damaged Corvettes were kept as-is for display, and a "Corvette Cave-In!" exhibit opened in 2016. ~24 miles from Cave City. Restored and revived portion of Santa Claus Town, a never-completed 1930s mega-Christmas-themed attraction. Now a full-time candy shop.